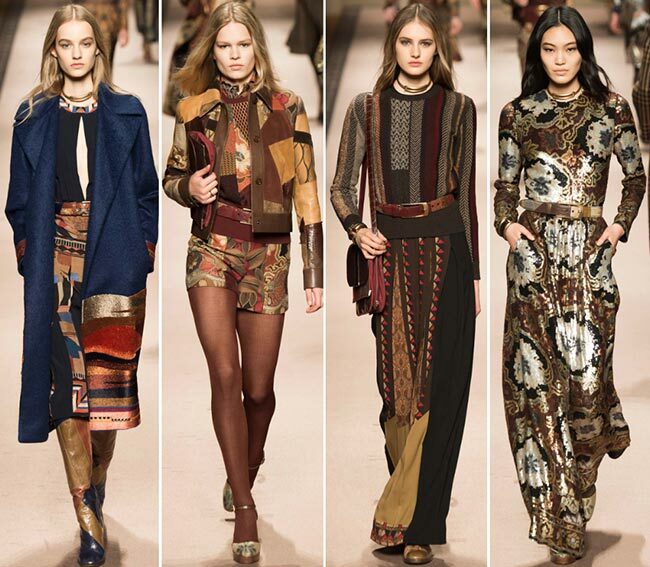 The paisley pattern has been synonymous with the Etro brand and a constant source of inspiration. It is an ancient decorative feature from Mesopotamia that symbolizes the shoots of the date palm tree, also known as the tamar, representing the tree of life. In the 19th century, this design was adopted by designers and recreated into shawls, as well as using it on precious hand-woven Indian fabrics earlier on. 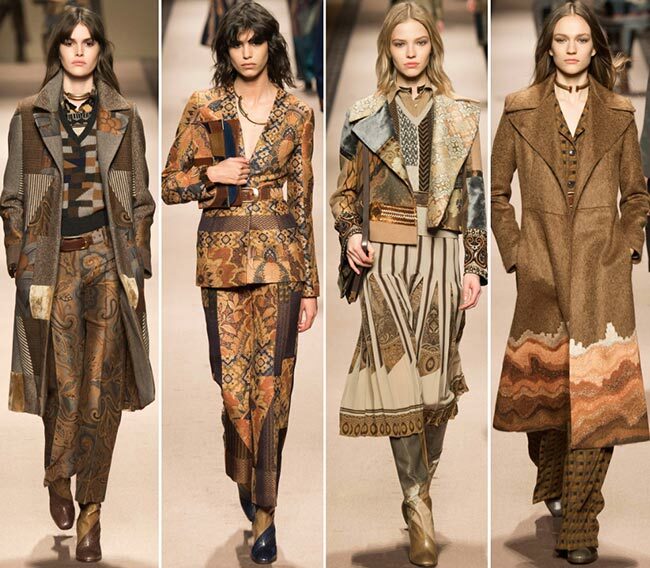 It was in 1968 that Etro was founded by Gimmo Etro, but it was not until 1984 that the paisley pattern became a staple of the Etro fashion house collections, inspired by the hundred and fifty cashmere shawls dating back to the 1810 to 1880 time period. The Italian luxury fashion brand of the modern day produces ready-to-wear pieces, shoes, jewelry collections, accessories, leather goods, textiles, home décor and perfumes. 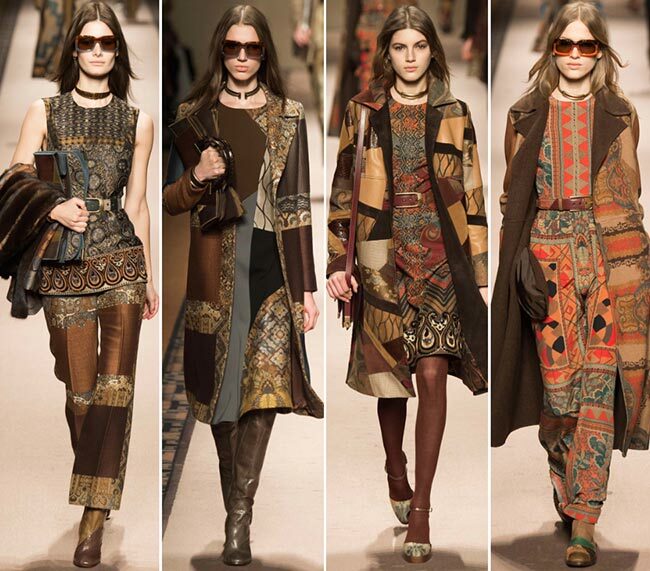 This year, we were treated to quite the artistic capacity with the Etro fall/winter 2015-2016 collection presented on the Milan Fashion Week runway today. 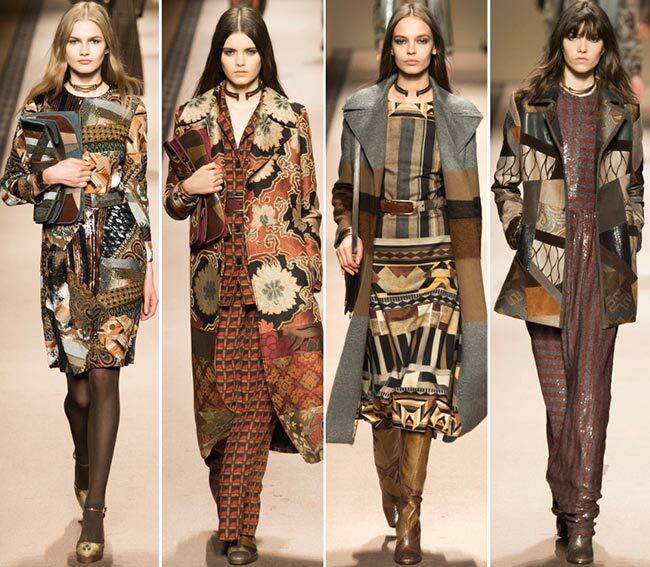 The fabrics were beautiful, the designs exquisite and the color combinations impeccably creative. There seemed to be a touch of the Indian influence here and there, while the modern woman is clad in revolutionized traditional pieces. 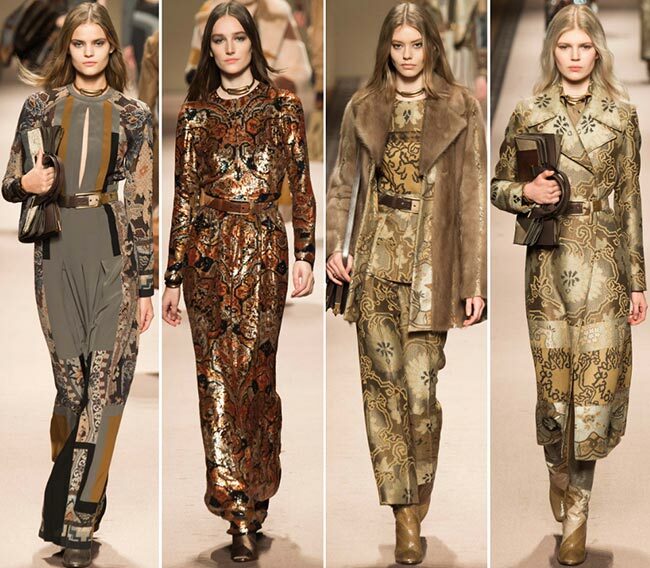 The show started off with a fun combination of paisley looser straight cut and pressed seam trousers cropped above the ankle and belted at the waist, a geometric designed coat that falls to the knees in cashmere wool and a V-neck blouse with matching jewelry pieces, the feet clad in a brown and camel colored striped boot. 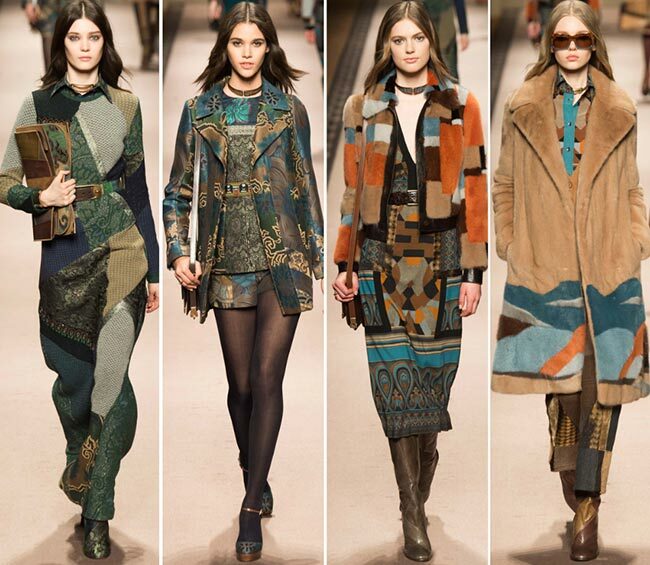 The colors and the styles continue on along the line-up, really having it stick out from all the rest. 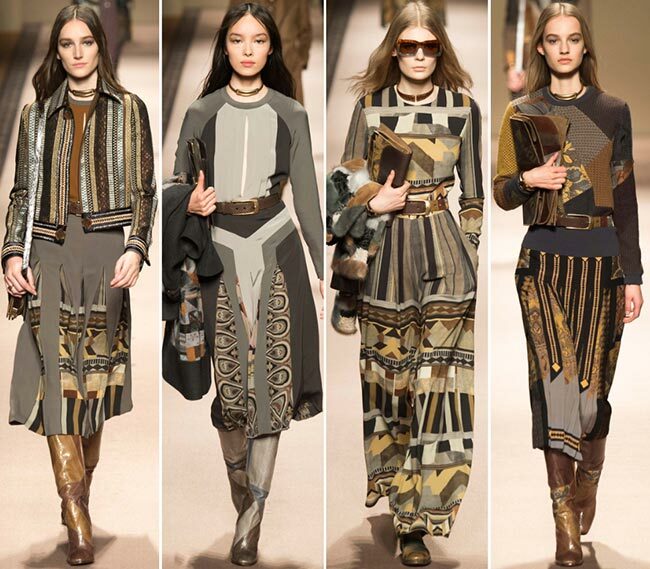 While it might not be the most glamorous collection on the Milan Fashion Week this season, it is certainly one of the most intriguing, if not the best out of all of them falling into that category. Some of the pieces are a lot more colorful with a lot more contrast than the rest, encompassing in them beige and camel, brick red and blue hues, browns and caramel, gentle golden coloring and white backgrounds. We have the navy and the grey, the deeper maroons and the incredible silks dyed in all these. Towards the end of the line we have a few brighter colors in lighter and deeper blues, as well as a touch of green paisley and a touch of olive for added effect. Those blues really make the pieces pop, standing out quite nicely among the rest of the shows taking place during the day. We have one ensemble that is ultra-modern and includes mixing up one of these patterned printed shorted with a maroon belt with a high neck print tight sweater tucked in, a leather jacket with all these prints and fabric patchworks pulled over. It is especially beautiful because of the brick red tights and the platform heels with the ankle straps. Those shoes with the tights look just as good on a long sleeve suede and print dress that combines floral patterning with maroon and black color blocks, accessorized with a choker necklace and a pretty little maroon handbag to boot. 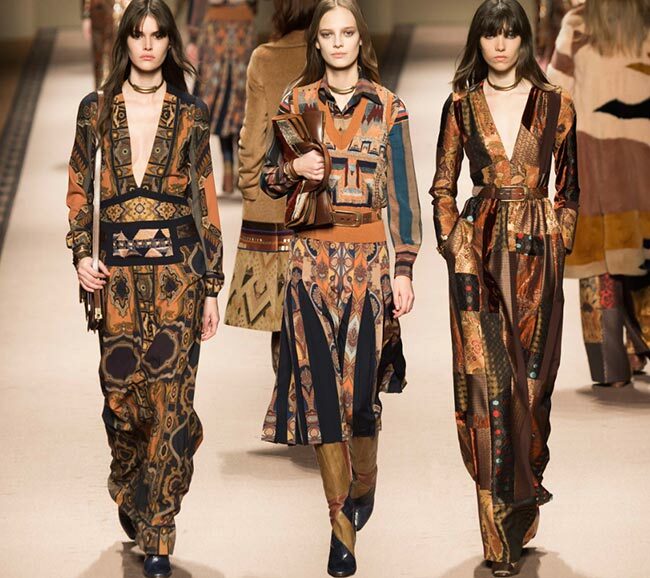 Once one gets used to these lovely designs, it’s hard to keep looking at the plain old color blocks without the added spice of these Etro textiles.